Perfectly fudgy and moist brownies that have an oozing salted caramel center. 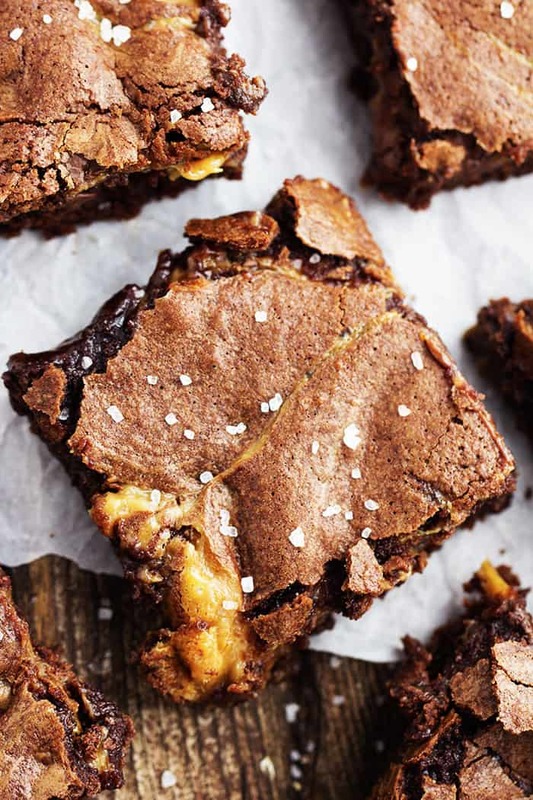 These will be one of the best brownies that you sink your teeth into! I made these brownies a couple of days ago and still can’t get over how amazing they turned out. My boys were home for spring break and needed a yummy treat. They love brownies. 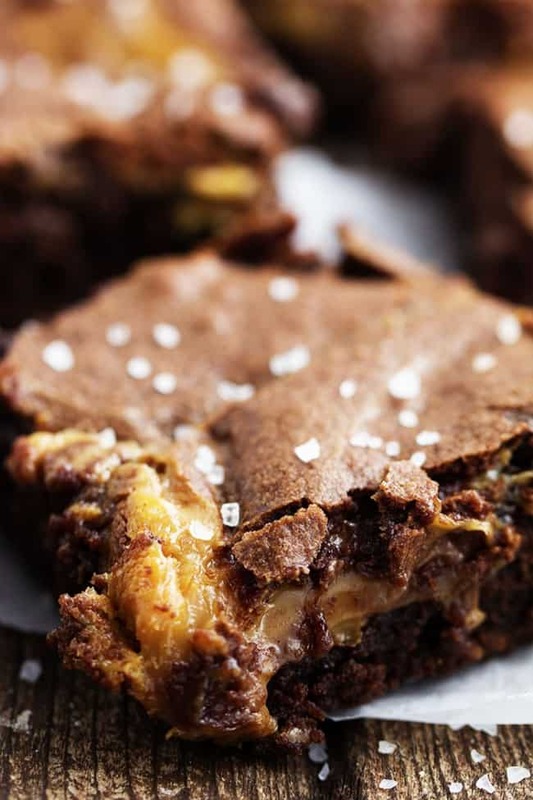 But the salted caramel oozing inside took these brownies to a whole different level! Salted caramel is one of my favorite combinations. Love the salty and sweet together. Who would have thought that salt in a sweet and rich dessert would be so amazing!?! Let me just say that these were the BEST brownies that I have ever had! I couldn’t get over how perfect they turned out. I have never had a more moist and perfectly fudgy brownie. This brownie base is awesome. And then the salted caramel so ooey and gooey in every bite. Perfection. 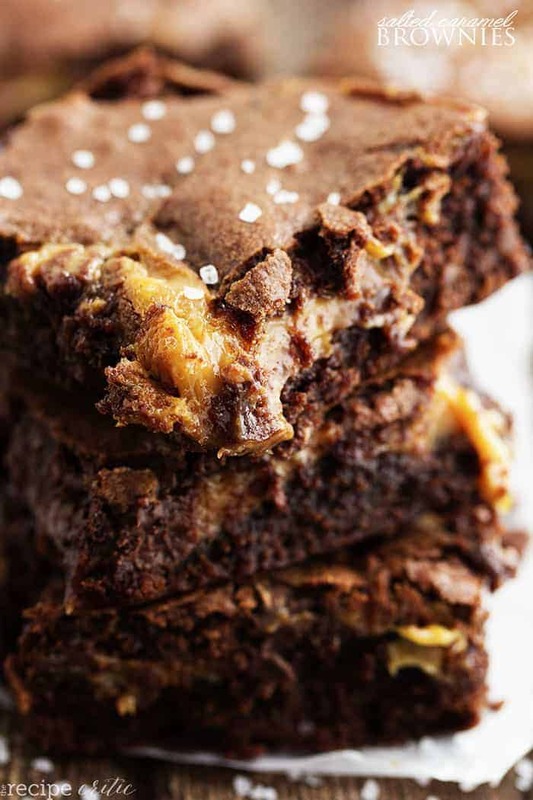 If you love an amazing brownie and salted caramel, this recipe is a must try! Preheat oven to 350 degrees. Line a 9x13 inch pan with parchment paper or aluminum foil and spray with cooking spray. This makes cleaning up easier with the caramel. In a large bowl combine the flour, salt, and baking powder. In another large bowl, beat together the sugar, cocoa, oil, eggs and milk. Add the dry ingredients until blended. Fold in chocolate chips. Spoon two thirds of the batter into the greased 9x13 inch pan. Bake for 12 minutes. Meanwhile prepare the caramel filling. In a microwave safe bowl, heat the caramels and sweetened condensed milk stirring 30 seconds at a time until melted and smooth. Can also melt over medium low heat in a saucepan. Pour the melted caramel over the warm brownie layer. Sprinkle coarse sea salt on top. Drop remaining brownie batter over the top of the caramel and carefully swirl the top with a knife. Bake for an additional 35-40 minutes or until toothpick inserted in center comes out clean. Do not overbake. Allow the brownies to completely cool before serving. Can also garnish the brownies lightly with additional sea salt. You just made my day with these, Alyssa! Can’t wait to try them! I just made these brownies for my family and they were a major hit. Absolutely amazing!! Thank you so much for sharing!! I made these brownies with the intent of cutting the down the recipe 3/4 in size because of the pan size I that I had (I don’t care for thin brownies and wanted them thick). I have to admit, reading the recipe without my glasses on and mixing up some of the quantities of the ingredients made me a little bit afraid for the outcome. And I did not prebake the first layerm another mistake. And, my grocery store did not have Kraft caramels, so I had to use a very expensive brand (Werther’s) that are little bit harder than typical caramels. I had to cut the condensed milk and half. Needless to say these are still the best brownies I have ever made. I took them to a family BBQ and they were gone before we even ate dinner. I can’t even recreate my mistakes, because I was floundering throwing in extra flour and sugar trying to save it. Don’t skimp on the coarse sea salt, it really makes it. To get the salt to stick to the tops of the brownies, I just brushed​ the tops with a very very light film of water and the salt stuck wonderfully..
Hi. My oven only goes up to 220deg. 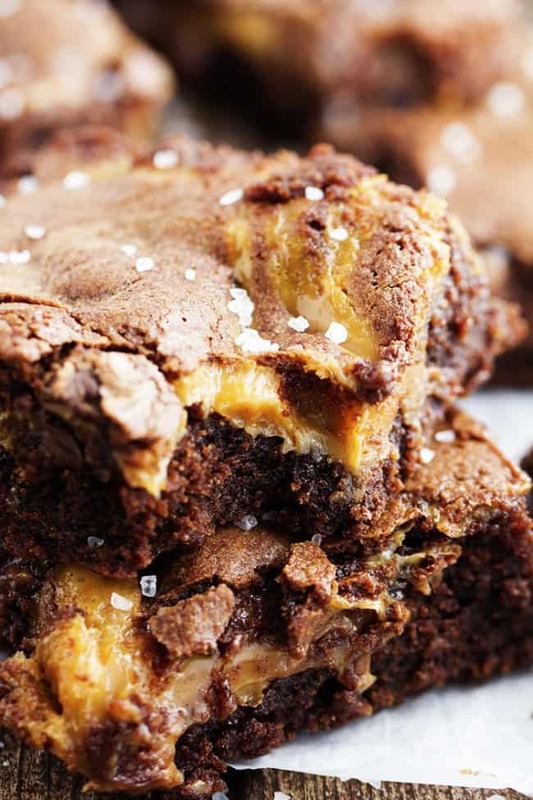 How long would u recommend cooking the salted caramel brownies for? OMG!! Absolutely THE BEST brownies we have ever had! Followed recipe exactly. Will be making these for life. To everyone reading – MAKE THESE. This is THE recipe. Thank you so much.